VERY successful book signing this weekend! Sold several copies of the Eisner Award-winning Complete Wimmen’s Comix, Eisner Award-nominee Pudge Girl Blimp, and Last Girl Standing. 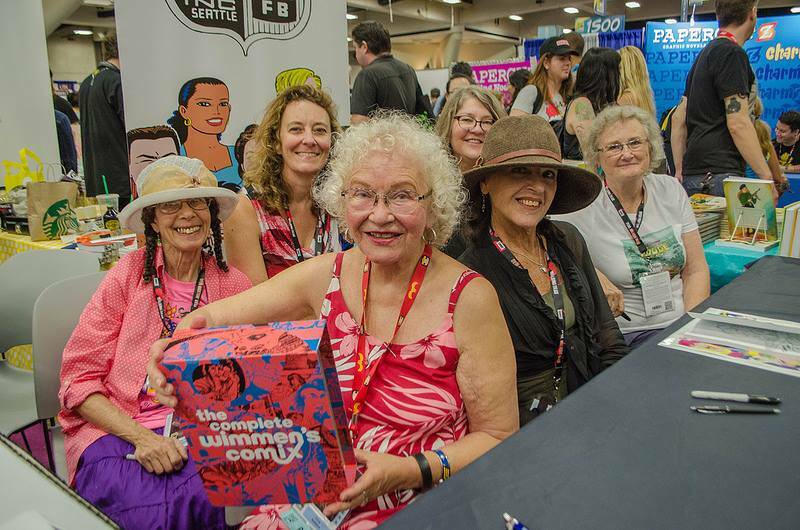 Delicious reunion of ole farts…uh…still-producing artists: first row = Willy Mendes, Trina Robbins, Terre Richards second row = honorary muse Leslie Carbaga, Lee Marrs, Sharon Rudahl. Special thx. to Bart’s Books and Terre, whose perseverance made it all possible. The 2016 San Diego Comic-Con. Celebrated 44th anniversary of Wimmen's Comix Collective with the publication of "The Complete Wimmen's Comix".